* The sweet hat is from another die called Duck Accessories (4X6). This die includes the hat, an umbrella, flower and float - it's very, very cute! * I used a paper punch for the daises around her hat and added a bit of pink bling! * The banner, sign and grass are all from files I purchased at the Silhouette Online Store. * The tulips are a cut file from Miss Kate Cuttables. I gave them some cute PK faces using the Everyday Character Assortment stamp set (PK-490). * I used lots of pop-dots to add a bit of dimension to all the images! This little project went together pretty quickly and brings such a nice touch of spring into my family room! I love the size of these smaller shadowboxes - they are wonderful for a touch of seasonal decor without taking up a lot of space. Well, that's about it for me today. If you haven't left a comment on my "give-away" post, you still have time! You can find that post here. I will be announcing the winner on Friday and I hope to see you then! My goodness Tanya, this shawdow box is adorable!!! It is so cute, love the tulip faces and that duckie is the cutest thing ever! Ca-ute!!! wow- this is so super Cute!! love it!! 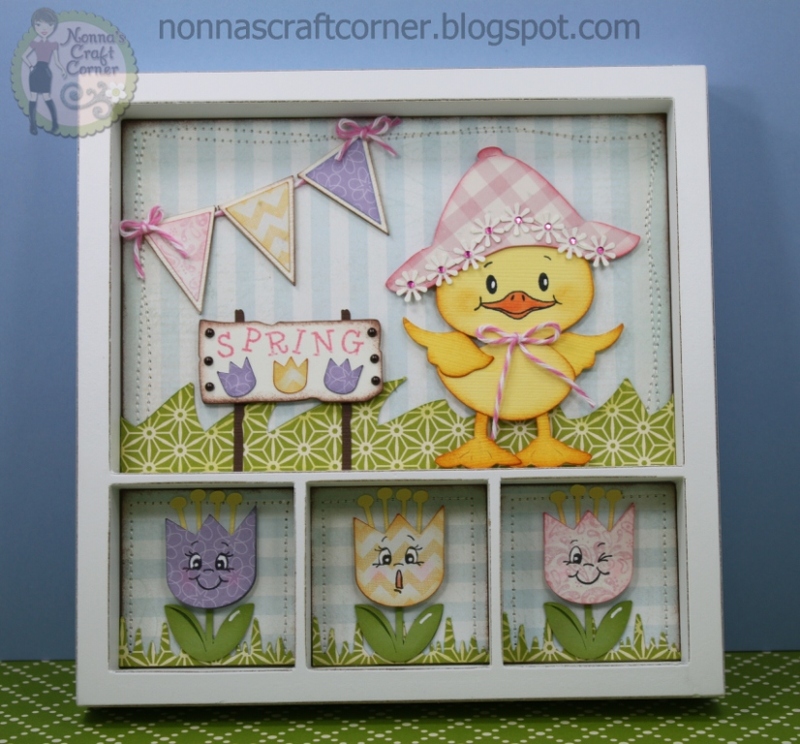 Now this is the cutest shadow box. Love every inch of it. Well done my friend. OMGoodness! This is just so stinkin' cute! I could eat it UP! :) Awesome, as always, Tanya! 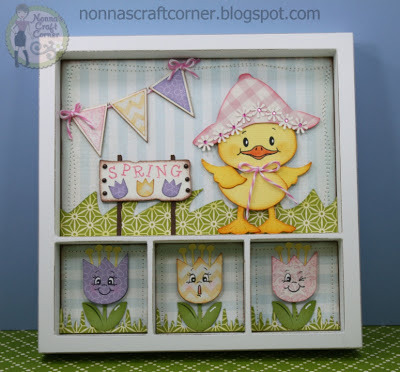 What a fun shadow box! I love the little tulips! WOW! !This is SERIOUSLY TOO CUTE!! Oh Tanya she is just precious! I have this die and I was just thinking it is about time to get her out. Now to go and buy a shadowbox! Absolutely adorable! eeek!!! soooo cute!!! I would LOVE to have this in my house!! Do i really need to let you know how ADORABLE this is? I'm sure you know cause I'm SO jealous it's yours! OMGosh... this is absolute Adorable, LOVE LOVE LOVE it so much. The details and the pks faces are so cute. They just bring life to everything I swear. Adorable! This is going to Pinterest! Tanya - this is fabulous. So sweet and adorable. Love all the papers and those faces are so wonderful. Thanks for sharing this great creation. WOW this is amazing! I just love the colors you used and the layout! Home decor is one of my favorite things because it is so useful. This is just great thanks for inspiring me to get to some home decor stuff!!! 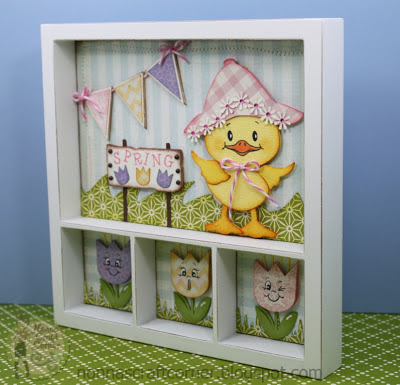 Oh man...I LOVE this adorable shadow box! The chickie is so adorable and just love her stylish hat! The tulips are super cute and just bring a smile to my face:) The PK faces are perfect:) So AMAZING-LOVE THIS!!!!! Tanya, this is too cute!. 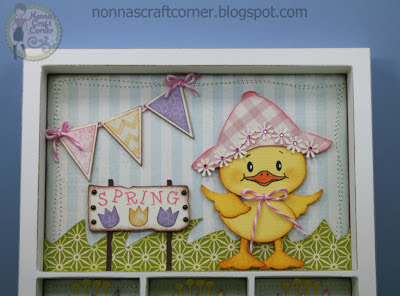 I love this little duck and all the embellies that you used. Who wouldn't love this for Easter. Just adorable. Tanya ~ Oh this is just DARLING! I LOVE that little duckie and forgot I had him or her! The flowers on the hat are so CUTE! Then those little tulips~ too SWEET! 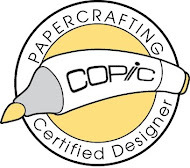 Of course the paper hoarder in me LOVES the paper but that box ~ I have on in black now I need it in white! 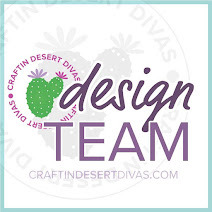 As always love stopping by to see what AWESOME creation you have in store for us! You know our cleaning fairies ~ well another bloggy friends said hers is missing too ~ she heard they are in AC ~ I bet yours is there too! LOL! Good thing is she also said she heard from them ~ they are winning anything! LOL! Have a great day! This is absolutely adorable! You did a fantastic job with the colors and filling the space nicely without making it look "too busy." 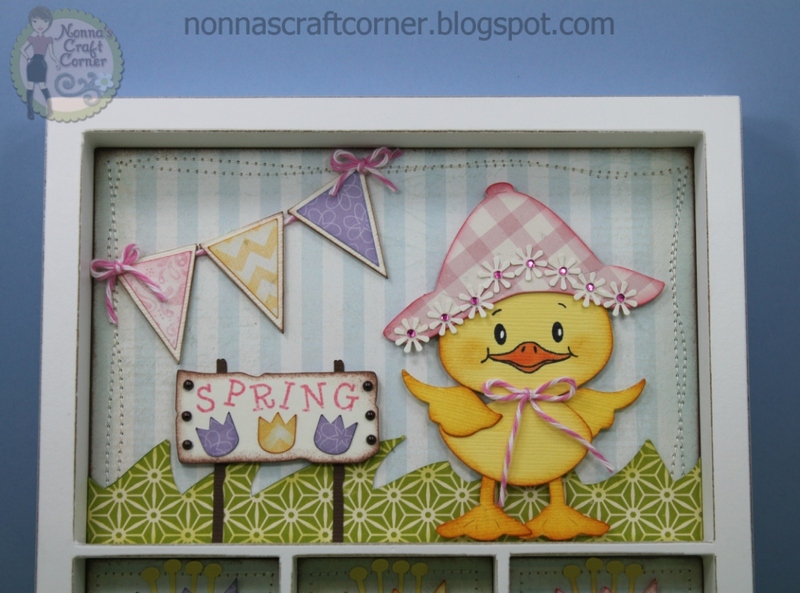 Your shadow box creations is amazing, I love all of the fun details you added!